Is it true that you only signed up because you thought Paul Rodgers was going to be the singer? It was a big reason why. I said, ‘If you’re looking for a bass player to take Roger Glover’s place, I’m not that guy.’ And they said, ‘Well we’re going to ask Paul Rodgers to sing’, and very quickly my brain went, ‘Hmmm… wouldn’t that be an opportunity to sing some stuff with one of the greatest blues rock singers in the world?” And then when Ritchie Blackmore said to me, “We want you to sing, and we want to have another guy in the band with a bluesier, deeper voice…”, I signed on the dotted line. And then of course the next week we all found out that Paul had joined Bad Company. But the way it turned out, singing with David Coverdale was perfect. Purple wanted to get away from the vibe of what Mark II was, the Gillan and Glover thing. They didn’t want anybody to play like Roger, they didn’t want anybody that sang in the way Ian sang – he didn’t have a bluesy voice at all. What they wanted was for two guys to come in, one guy to share vocals with another guy, and one guy to play a different kind of bass. Which they got. Andrew’s a big Queens Of The Stone Age fan, and he wanted to get this guy in [QOTSA drummer Joey Castillo]. I was like, ‘OK, whatever.’ But it didn’t work. I was left with a young kid and I drummer that I didn’t particularly want in the band. When you’re in that situation, it’s not going to happen. the Planet Rock Main Stage. Tickets are available. 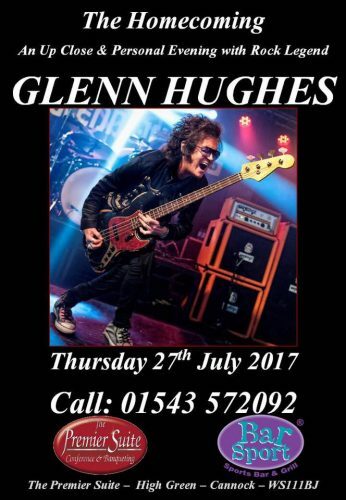 Two days earlier, on July 27th, Glenn will also appear at the Premier Suite Lounge in Cannock in an “up close and personal” homecoming event (that’s the town where he was born and bred). Thanks to Yvonne and Express & Star for the info. Just as a matter of interest, regarding Glenn’s old sparring partner JLT. An RCA set comprising 4 albums is being issued, from Joe’s time with his pre-Rainbow band Fandango. The band featured both Joe & his friend & (excellent) guitar player, the late Rick Blakemore. Exactly. 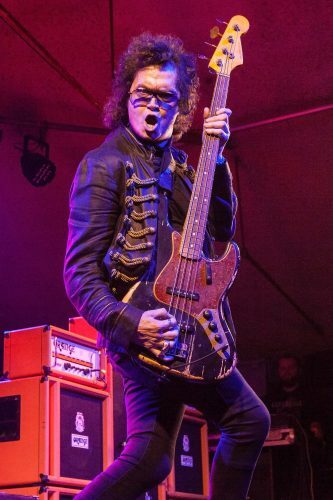 All the moaning about Mk III not being up to par with Mk II and David and Glenn hijacking the band from Blackers … Blackmore made a conscious choice/decision in 1973, and if he didn’t hear where Glenn’s bass playing and singing would take him, he was deaf. One listen to “You Are the Music, We’re Just the Band” (the album) was sufficient. Blackmore wanted to go into a Free/Bad Co-type direction and that is how he plotted the new line-up. It did what it read on the tin. And I only recently revisited the California Jam footage to notice that Blackmore drew more smiles about Glenn’s bass playing, singing and general antics that evening then I have ever seen him do with Roger. He was obviously pleased how Hughes was working out. That’s not putting Roger down, he actually plays the more sophisticated and melodic bass lines compared to Glenn, but he does it unobstrusively. Glenn’s more simplistic, yet up-front bass playing, on the other hand, clamors for attention and is edgier. And one listen to how Glenn grooved during DP-live versions of Mistreated compared to all hamfisted Rainbow bassists who failed to do the same years later proves the point. Don’t argue with me, I’m a bass player myself! ; – ) Influenced in equal measure by Roger and Glenn and, yes, even Nick. @2 uwe hornung, hey buddy, you’ve got me interested. Is there anywhere on the internet, such as youtube, where I can see you playing your bass, like as part of a band or something?. Man, you can’t just go on boasting about it & then deny us all the pleasure of seeing & hearing you perform!. Smiles to ya.